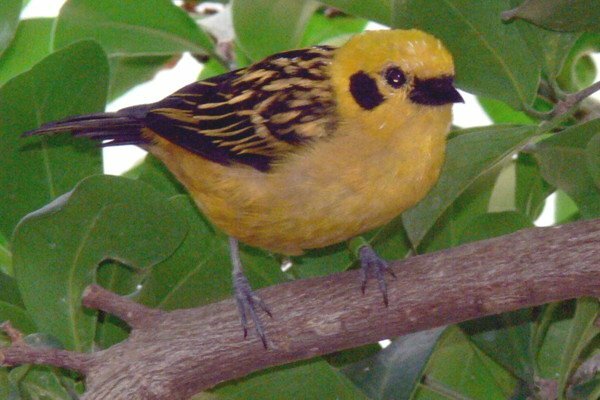 Tangara is a large genus of birds of the tanager family. It includes about 50 species, but as currently defined the genus is polyphyletic. 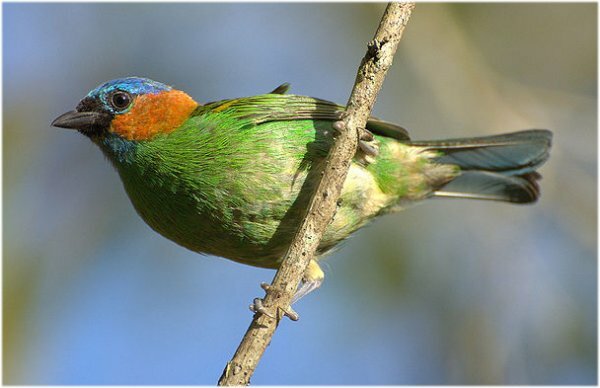 All are from the Neotropics, and while most are fairly widespread, some have small distributions and are threatened. They are fairly small, ranging in size from 11.515 centimetres (4.55.9 in). 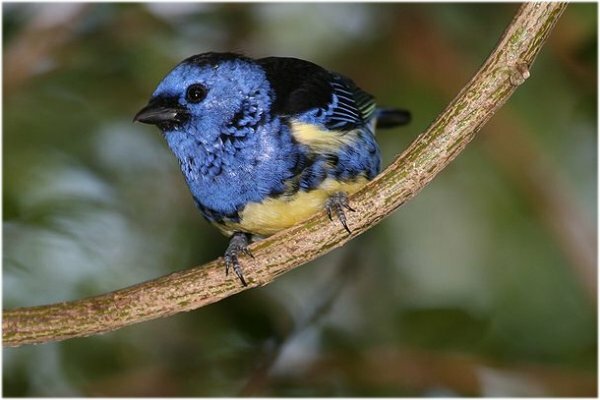 This genus includes some of the most spectacularly colored birds of the world. These tanagers are mainly found high in forest canopies, but some occupy more open habitat. They are found at all elevations below tree line but are most diverse in the Andean subtropical and foothill forests of Colombia, Ecuador and Peru. 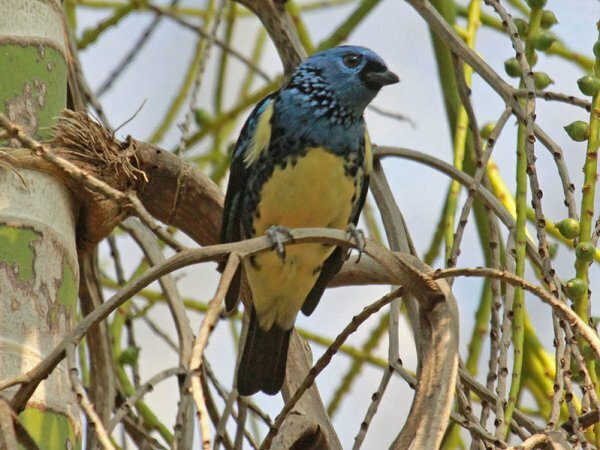 The female builds a usually well concealed cup nest and lays two brown- or lilac-speckled white eggs. These hatch in 1314 days and the chicks fledge in a further 1516 days. The male and female feed the nestlings on insects and fruit, and may be assisted by helpers. Tangara tanagers pick insects from leaves, or sometimes in flight, but fruit is a major dietary item, accounting for 53-86% of food items in those species which have been studied. Colombia and Venezuela south to Bolivia and much of Brazil (despite its scientific name, it is not found in Mexico). paler, more cream in the nominate subspecies found in north-eastern South America. edging to the primaries and a white belly. the rump is yellow and red or all red. The beak is black and the legs are grey. Venezuela, Peru, Colombia, Ecuador, Bolivia, Brazil and the Guianas. Despite its scientific name, it is not found in Chile. 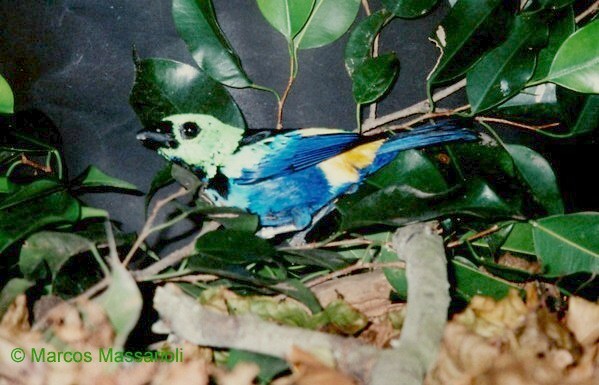 The Paradise Tanager is common throughout its range. and far north-eastern Argentina (Misiones only). 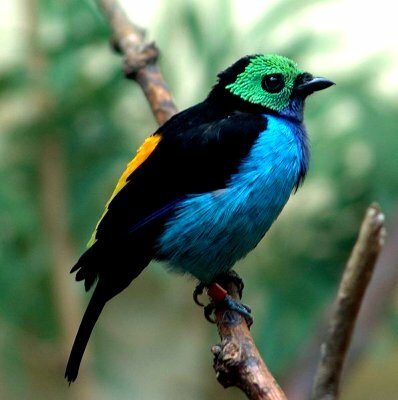 As other members of the genus Tangara, it is a small colorful bird, measuring an average of 13.5 centimeters. making itself inconspicuous, as its apparently flashy blue-green coloration camouflages it well amongst the foliage. chasing the latter from a perch. 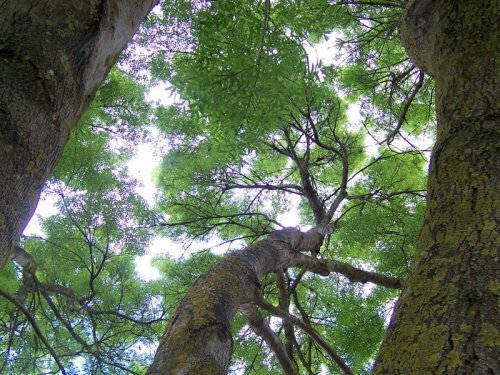 For forests, canopy refers to the upper layer or habitat zone, formed by mature tree crowns and including other biological organisms (epiphytes, lianas, arboreal animals, etc). 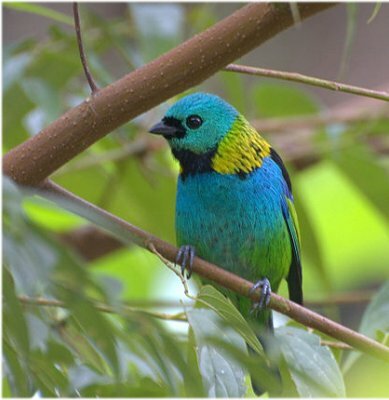 The Red-necked Tanager, Tangara cyanocephala, is a species of bird in the Thraupidae family. highland forests of the Andes (from Bolivia and northwards) and Venezuelan Coastal Range in north-western South America. Its plumage is overall golden-yellow with black to the back, wings, tail and ear-coverts. Some subspecies are partially/largely brown below. 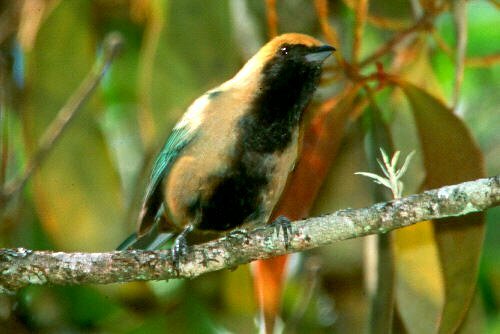 species of bird in the Thraupidae family. as well as most of the east of that country, Paraguay and northeast Argentina. It also occurs very locally in Bolivia and Peru. and tail. Females are duller than the males, and have black restricted to a poorly demarcated "shadow" of a mask. with a short trunk hidden in a thicket of branches. Some trees can live over 30 years. The leaves are alternately arranged with 1-2 inch long, elliptic, and finely toothed leaflets. 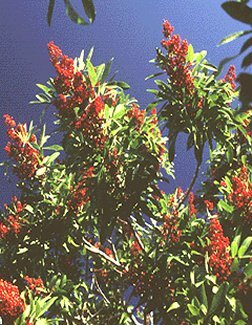 fruits are borne in clusters that are initially green, becoming bright red when ripe. through November and fruits are usually mature by December. 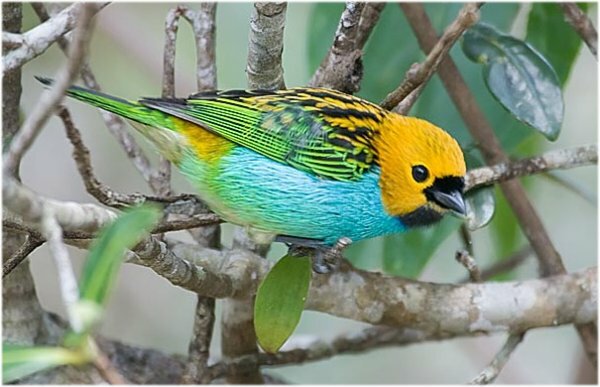 The Gilt-edged Tanager, Tangara cyanoventris, is a species of bird in the Thraupidae family. It is endemic to Brazil. between 500 and 1,000 metres asl. They are golden-yellow above with heavy black streaks on the back and lighter black streaks on the crown. Underparts are mostly turquoise moving to green on the lower belly and yellow on the lower flanks. The forehead and throat are black. 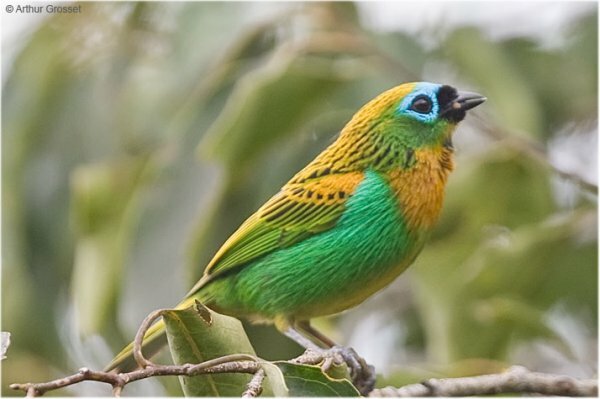 The Brassy-breasted Tanager is a Brazilian endemic found in and on the edges of the Atlantic Rain Forest of south-east Brazil. 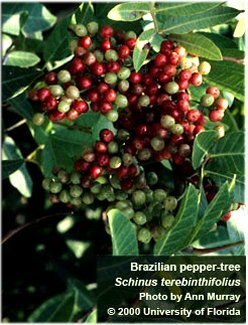 It forages for fruit and insects in the canopies of trees and is often in small groups of about a dozen individuals. It is emerald green with black streaks above with a black round the bill and turquoise on the forecrown and round the eyes.